Watering the Seed is an invaluable offering to all aspirants on the path of devotion. Inside you will find many wonderful personal exchanges between Srila Prbhupada and his dear disciple Giriraj Swan who shares his realizations with the honest wisdom, and humility for which he is known and loved. 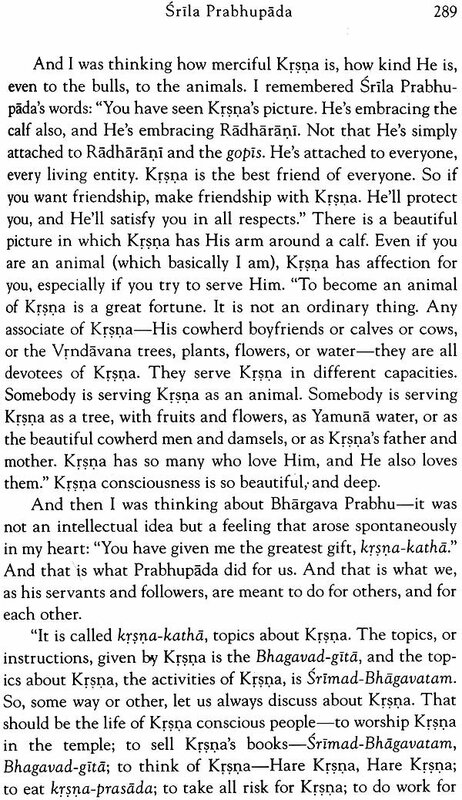 He recounts how Lord Krishna’s beloved gardener, Srila Prabhupada, toe such great care to water the seed of devotion within his heart. You will be transported into Srila Prabhupada intimate association during some of the me historic moments of ISKCON's development You will be given entrance into his private quarters to witness his gentle fatherly 10 toward his young and sometimes perplexed spiritual child. Srila Prabhupada's innocent child like humor will bring joy to your heal You will see how he, in his compassion for t. conditioned souls, overcomes all opposition with unrelenting determination and fait You will hear Srila Prabhupada's spontaneous philosophical perspectives both in times crisis and in everyday life. In 1965 His Divine Grace A. C. Bhak vedanta Swami Prabhupada embarked upon a mission that would fulfill an ancient, Iongawaited prophecy. His spirit of selfless compassion passion will be imprinted forever upon the pages of religious history. 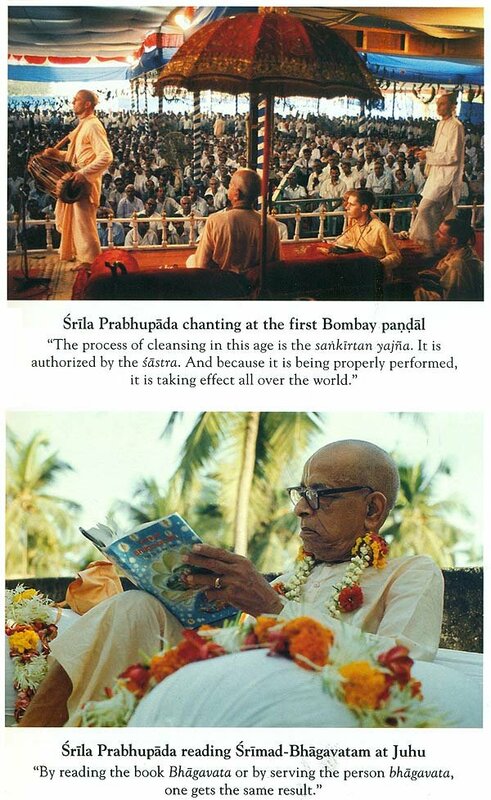 Those illustrious souls who stepped forward to sacrifice the lives to help Srila Prabhupada became the dearmost recipients of his priceless blessing his Holiness Giriraj Swami is one such shining jewel in the necklace of Sri la Prabhupada beloved followers. Giriraj Swami is a spiritual leader and initiating guru in the International Society for Krishna Consciousness (ISKCON). He met his spiritual master, His Divine Grace A. C. Bhaktivedanta Swami Prabhupada, in 1969 and followed him to India, where he made significant contributions to Srila Prabhupada's mission, most notably overseeing the development of Hare Krishna Land in Juhu, Bombay. Later he led the development of the Bhaktivedanta Ashram in Govardhana, and the Kirtan Ashram for women, the Bhaktivedanta Hospice, and the Institute of Palliative Care, in Vrindavan. He was awarded sannyasa, the renounced order of life, in 1978, became a member of ISKCON's governing commission, and oversaw the Society's activities in Bombay, Mauritius, South Africa, Spain, Portugal, Sri Lanka, and Pakistan. He has preached extensively in India and throughout the world. Giriraj Swami is now focused on Srila Prabhupada's personal instruction to him to write. He has been a frequent contributor to Back to Godhead magazine and is working on several books and publications. In 1965 His Divine Grace A. C. Bhaktivedanta Swami Prabhupada embarked upon a mission that would fulfill an ancient, long-awaited prophecy. His spirit of selfless compassion will be imprinted forever upon the pages of religious history. 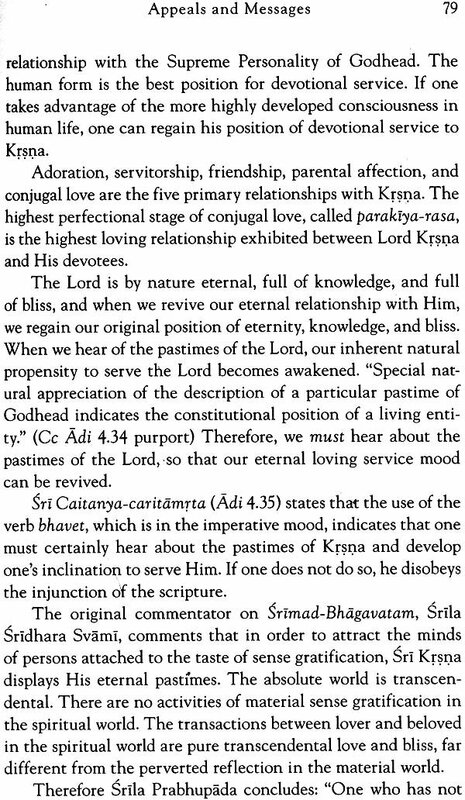 He spread the eternal message of Sri Caitanya Mahaprabhu through- out the world. By his words and example, Srila Prabhupada established that Krsna is the Supreme Personality of Godhead, that all living beings are His eternal servants, and that the ultimate perfection of life is to awaken pure love for Krsna through the sublime method of chanting His holy names. With tears in his eyes, Srila Prabhupada would appeal to his followers to assist him in his divine service to humanity. Those illustrious souls who stepped forward to sacrifice their lives to help Srila Prabhupada became the dear most recipients of his priceless blessings. His Holiness Giriraj Swami Maharaja is one such shining jewel in the necklace of Srila Prabhupada's beloved followers. Giriraj Swami is the son of a well-known and respected attorney, judge, philanthropist, and advocate for religious free- dom. In fact, to honor his father's contributions to jurisprudence and the community, Cook County, which includes Chicago, dedicated a courtroom in his name. After graduating from a prestigious university in Boston, Giriraj Swami dedicated his life to the path of pure devotion. Renouncing the pleasures of material opulence and prestige, he became one of the pioneers in Srila Prabhupada's mission in India. 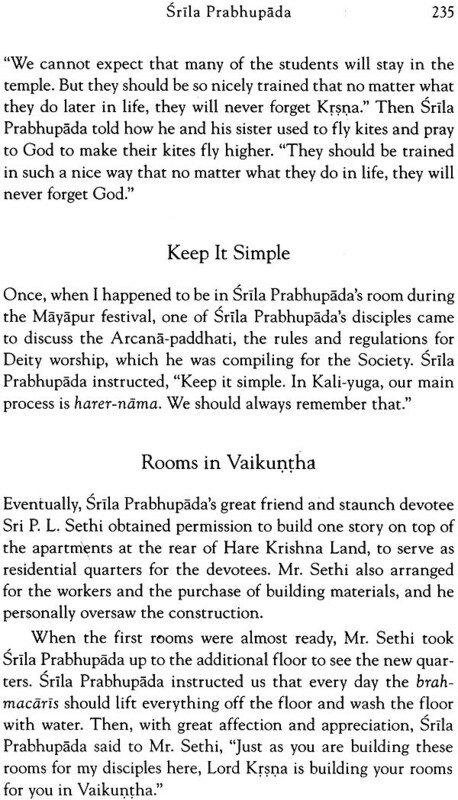 Srila Prabhupada wanted to establish a temple for Sri Sri Radha and Krsna in Bombay. There was no support. Giriraj Swami lived in sub-poverty conditions on a plot of land infested with rats, mosquitoes, and life-threatening diseases. Corrupt government officers and gangs of criminals were creating continuous dangerous disturbances. Still, Giriraj Swami remained faithful, lovingly enduring all obstacles to please his spiritual master. His father and mother came to India. They offered him a million dollars if he would return home. 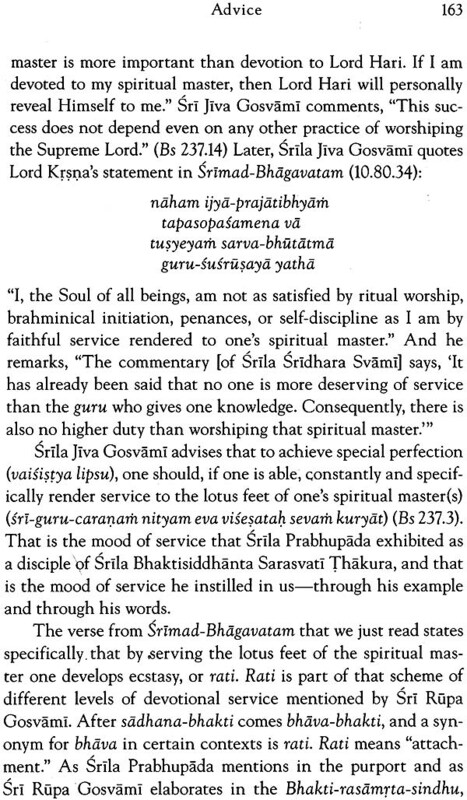 But Giriraj Swami replied that his service to Srila Prabhupada was a treasure beyond all the wealth in the world. Srila Prabhupada saw in Giriraj Swami a genuinely surrendered servant and thus invested him with immense responsibility and great trust. 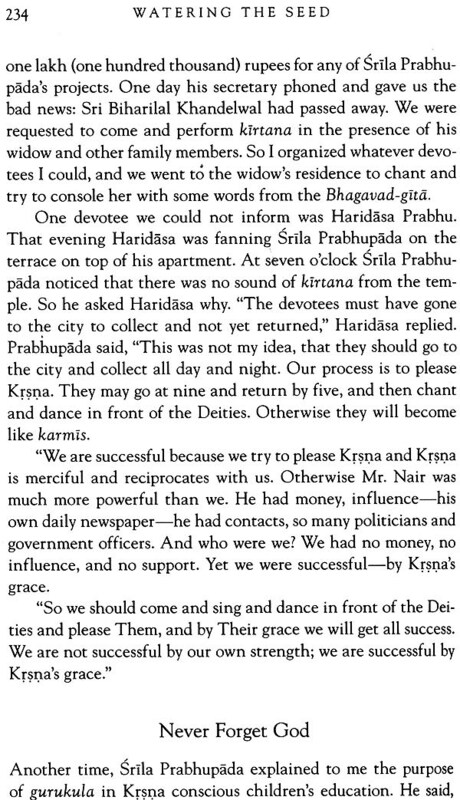 Srila Prabhupada offered him the rare gift of being one of his close personal associates. Watering the Seed is an invaluable offering to all aspirants on the path of devotion. 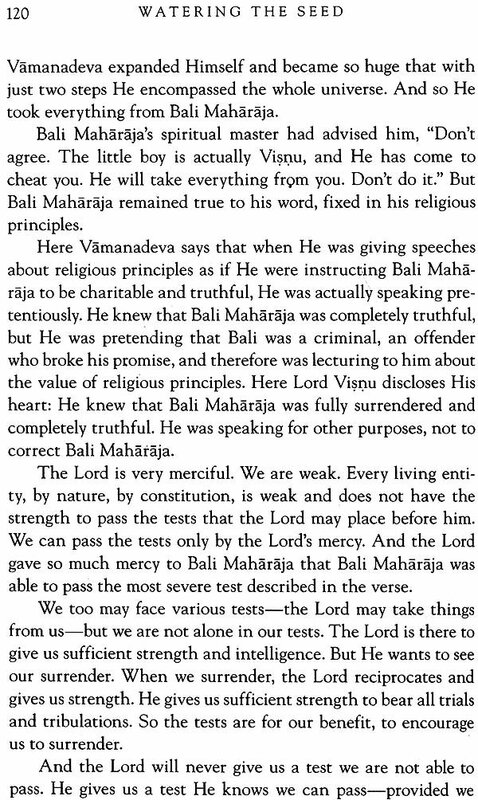 In this book we will find many wonderful personal exchanges between Srila Prabhupada and his dear disciple. Giriraj Swami kindly shares his realizations with the honesty, wisdom, and humility for which he is known and loved. This book will transport us into Srila Prabhupada's intimate association during some of the most historic moments of ISKCON's development. We will be given entrance into his private quarters to see the beautiful human qualities of a world acarya from behind the scenes. We will witness his gentle fatherly love toward his young and sometimes perplexed spiritual child. 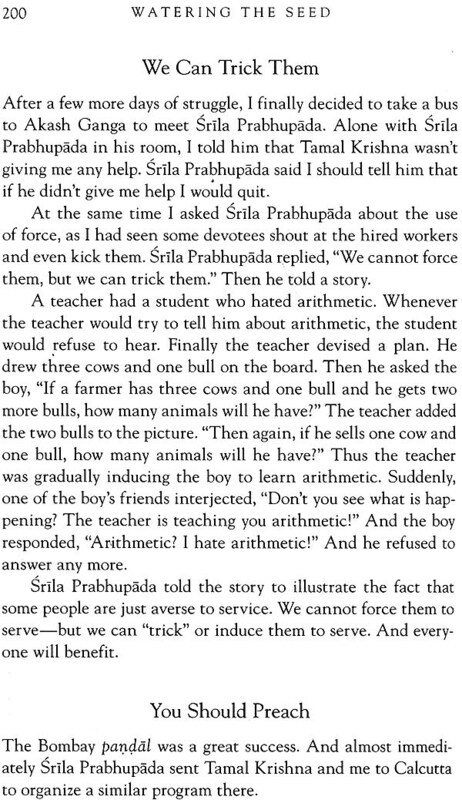 At the same time, Srila Prabhupada's innocent childlike humor will bring joy to our hearts. We will see how Srila Prabhupada, in his compassion for the fallen, conditioned souls, overcomes all opposition with unrelenting determination and faith. Throughout these pages we will hear his spontane- ous philosophical perspectives both in times of crisis and in everyday life. Giriraj Swami recounts how Lord Krsna's beloved gardener took such personal care to water the seed of devotion within his heart. It is my great fortune to have the opportunity to write the foreword to this book, which is the first in a series of publications by my dear god brother and friend. 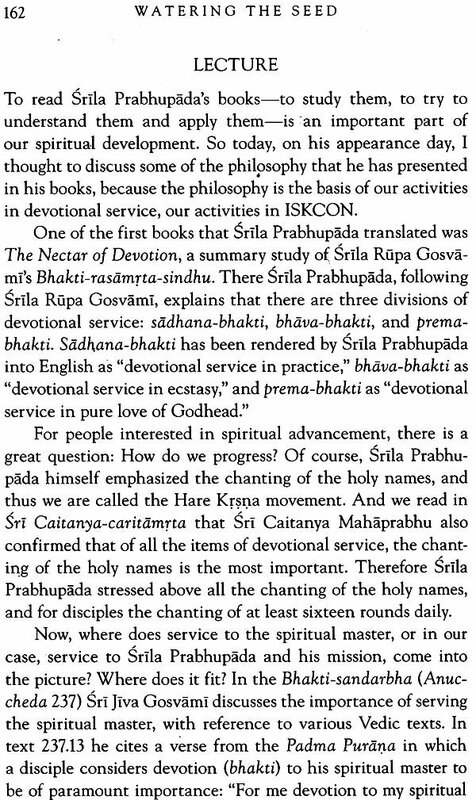 I pray that all who read watering the seed may be blessed with ever-increasing appreciation for Srila Prabhupada’s monumental contribution to our lives. "Out of many millions of living entities wandering throughout the universe, one who is very fortunate gets an opportunity to associate with a bona fide spiritual master by the grace of Krsna. By the mercy of both Krsna and the spiritual master, such a person receives the seed of the creeper of devotional service." 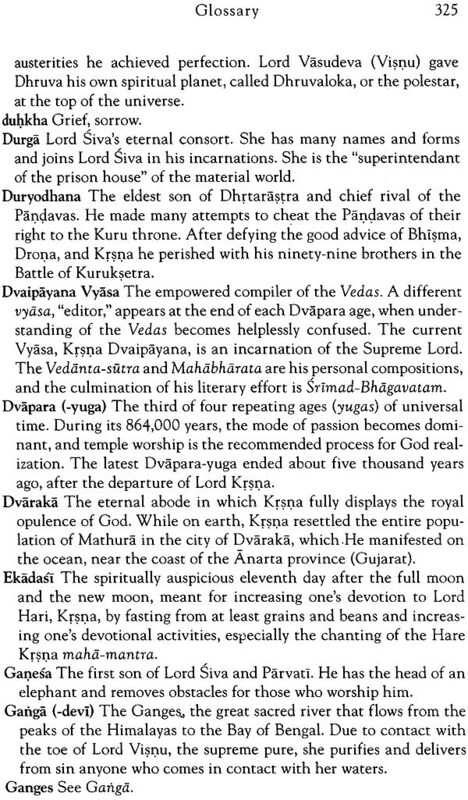 "Dormant devotional service to Krsna is within everyone. Simply by associating with devotees, hearing their good instructions, and chanting the Hare Krsna mantra, dormant love for Krsna is awakened. 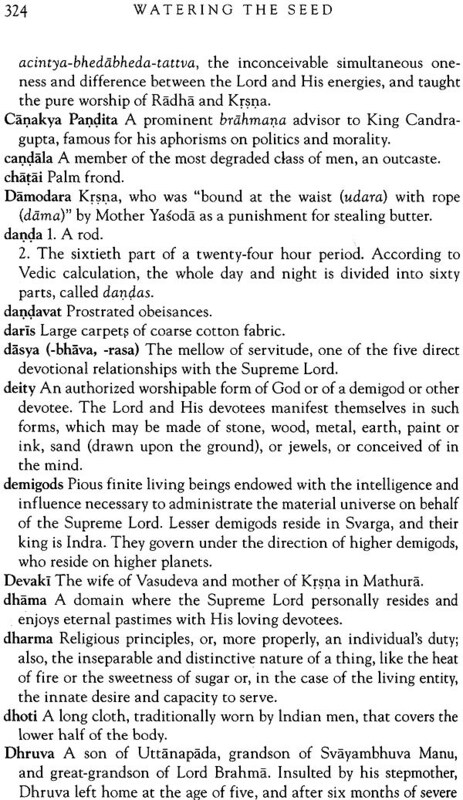 In this way one acquires the seed of devotional service." 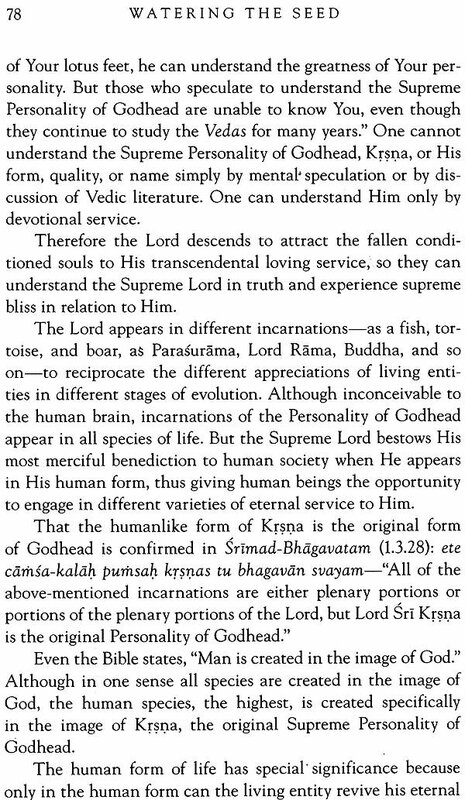 Here Srila Prabhupada explains, "By the mercy of Krsna, one meets the bona fide spiritual master, and by the mercy of the spiritual master, the disciple is fully trained in the devotional service of the Lord. "After receiving the spiritual master's mercy, one must repeat his instructions, and this is called sravana-kirtana- hearing and chanting .... One has to water the bhakti-lata-bija after receiving instructions from the spiritual master." By Srila Prabhupada's mercy we received the seed of devotional service, and since then we have tried to water it by hearing and chanting about Krsna. The present volume is a collection of my efforts to water the original seed Srila Prabhupada gave me when we first met. 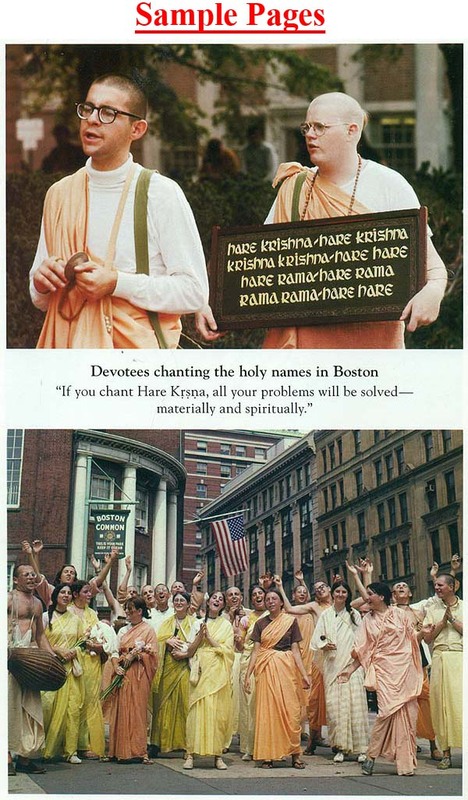 Several disciples and friends suggested I publish a collection of anecdotes and articles about Srila Prabhupada and Krsna consciousness, including already-published as well as new material. I have endeavoured to glorify Krsna and His devotees for my own purification, to water my own bhakti-lata-bija. 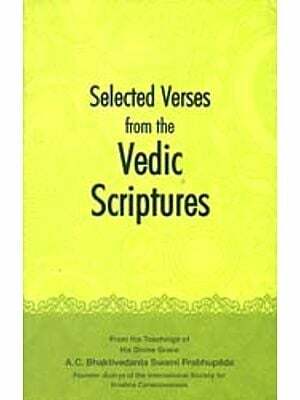 At the same time, if some spray or droplets of water touch the devotional creepers in your hearts-the hearts of the readers-I will consider my effort to be supremely successful.